P.S. I love this image - it is one of my favorite pieces of pentagram art. It is all over the net - if you know who drew it, let me know. If I remember correctly, the pentagram (which in my tradition stands for earth, air, fire, water and, at the top, spirit) is the five pointed star. A pentacle is the representation of that image with a circle around it. A pentacle is also the word used for the pentagram within a circle which is modeled in a three dimensional form either in gold, silver, clay, wood, glass, etc. 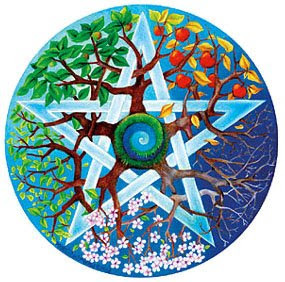 One place that makes lovely pentacles in both clay altar pieces and jewelry (I love the tree) as well as other Pagan and goddess themed gifts is a company called Dryad Designs. Wondering how to decorate an altar or mediation space for Beltane? Go to Flickr and type in "Beltane altars" in the seach function to get some inspiration. This simple, lovely and meaningful altar is one of my favorites. Ah... thanks for the inspiration and the reminders about Beltane. Somehow, it's almost slipped my mind. Too many dragons nipping at my heels (or something like that)!